The OUTreach Center provides support and services to the local LGBTQ community and has been actively involved in the Antelope Valley community since 2011. The group took part in Lancaster’s “Star-Spangled Holiday” parade on Dec. 7. LANCASTER – The OUTreach Center is inviting neighbors and supporters alike to an Open House at the Linda Verde Wellness Home this Saturday. The event will be held from 11 a.m. to 7 p.m., Saturday, Feb. 22, at the Wellness Home, located at 44848 Rodin Avenue in Lancaster. With gratitude to Antelope Valley Partners for Health, The OUTreach Center has begun programming for the lesbian, gay, bisexual, transgender, questioning (LGBTQ) community, allies, and neighbors at their temporary home. Providing presentations at the Wellness Home is the OUTreach Center’s first step towards occupying a permanent building. The Open House will include light refreshments, with a Game Night starting at 5 p.m. Guests are welcomed to view the house, admire the beautiful décor sponsored by High Desert Medical Group, and stroll the large yard. The OUTreach Center will also receive proposals for community presentations. The OUTreach Center provides support, services, and social activities to the LGBTQ community and allies of the Antelope Valley and its surrounding communities. 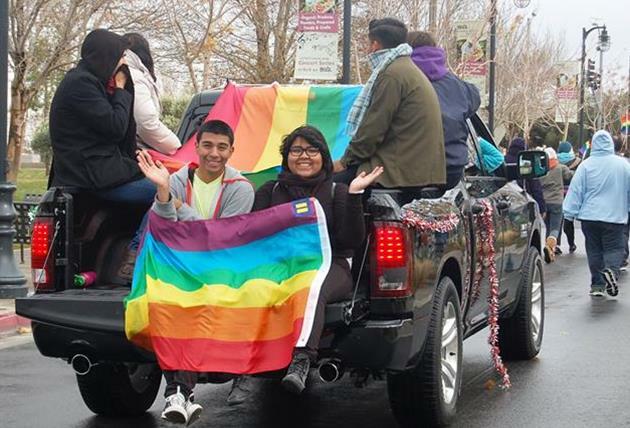 Since 2011, community involvement efforts have included AV PRIDE, National Coming Out Day, World AIDS Day, GSA and teacher training days, Transgender Day of Remembrance, and a three-time recipient of the Unite Lancaster Grants. The organization features an award-winning youth group, The Out Project, which runs social, educational, and service projects every Saturday; a transgender support group, TransInteractions; Gen-X Over-40 Support network; and provides meeting space for the local chapter of PFLAG, Parents, Families and Friends of Lesbians and Gays. Reaching over 1,200 contacts through social networking and internet contacts, The OUTreach Center aspires to serve the needs of the Antelope Valley LGBTQ community. The Wellness Home is open weekday afternoons, for community meetings, and by appointment. For more information about the OUTreach Center, contact Board President Sanie Andres at 661-92-PRIDE (661-927-7433), or visit www.OUTreachCenterAV.org. 13 comments for "OUTreach Center open house at the Linda Verde Wellness Home"
Just for clarification the ‘OUTreach Center’ AKA:The Antelope Valley GLBT Center was founded in 2004 not 2011. The 501c3 that the current board operates under is the same one that was acquired in 2004. Before 2011 the original founders and board hosted the first two AV Pride Festivals in Palmdale and first four World AIDS Day events held at AVCC. They also assisted with the AIDS Walk and held the first, of many, Candle Light Vigils for GLBT youth that had commuted suicide. I find it interesting that the current board, many of which we’re active volunteers pre 2011, have no recollection if the Centers early history. The article does not say the organization was founded in 2011. It merely states that, since 2011, the events The OUTreach Center has included in its programming are A.V. PRIDE, National Coming Out Day, World AIDS Day, GSA and teacher training days, Transgender Day of Remembrance, etc. I’m obviously confused. By definition, “These homes of wellness act to supply support to the people in the neighborhoods. A lot of them don’t know where to go get help for wellness. (AVT article 3/7/12)”. Does this mean that the majority of the LGBTQ community reside in this area? If not, then it seems like a more appropriate place to meet would be a business/community location (library, Allied Arts, LPAC, etc.) rather than a residential location. Also, “open house” is “an event in which an organization (such as a school or company) invites the public to visit in order to see the things that happen there.” This implies permanent residence. Finally, what does “the center has begun programming” mean? Again, no complaints or prejudice, just curious. While I am certain there are LGBTQ people who live in the neighborhood, the Linda Verde Wellness Home is open to the general public. The OUTreach Center simply operates the site and is able to offer programming, such as support groups, art workshops, counseling, etc. from the home. The Linda Verde Wellness Home is much more welcoming to many of members of the LGBTQ community than a typical business or community location might be. Hope that helps. You are required to support the gays otherwise you could be accused of discrimination and fined. I am sick of people who try to make themselves out to be “victims” of prejudice because others do not want to tolerate their efforts to interfere with certain groups of people’s liberties. No one says you have to support them. Just stop trying to prevent them from receiving equal rights. Who’s a victim? And, how is anyone denying them rights? Gays are more about forcing their lifestyle on others and denying others their right to chose. No one wants these “special” houses in their neighborhoods. They bring in noise and trash. Understandable for the close minded BUT to call them TRASH is pure disrespect. And the article says “temporary” until the funds a permanent building. If no one wants these houses I’m “their” neighborhood then they don’t want to help better the valley. You’re right, I don’t live next to one of these houses. The concept is a good one, however getting the community to use them is a problem. These homes should be a safe place for kids to go to work on homework, do science projects with a volunteer, neighbors having neighborhood watch meeting, learn about nutrition, take babysitting classes, play games. How do you get parents to come to parenting classes even when they desperatly need them. Getting people to use the homes without suspicion seems to have been a problem. You’re right, I don’t live next to one…..woulda, coulda, shoulda, seems to be the theme in Lancaster. Nice. Why is this legal to put this trash next to residents in a crime ridden street where just last Christmas they busted over $200k in stolen guns and items from twenty houses in that area! These houses sit vacant so we put them to use! Ok, you live next to one! Put one in the Mayors hood, sure those houses have much more space than these track homes. People have enough trouble selling houses in this city, gee, I wonder why? This seems illegal but then again, lawyers always know how to circumvent the laws they don’t like.